A pressure-sensitive type acrylic-emulsion adhesive created for permanent installation. This adhesive has unlimited open time with unlimited tack and may be used over concrete or aluminum substrates. Covers approximately 200 to 400 square feet. 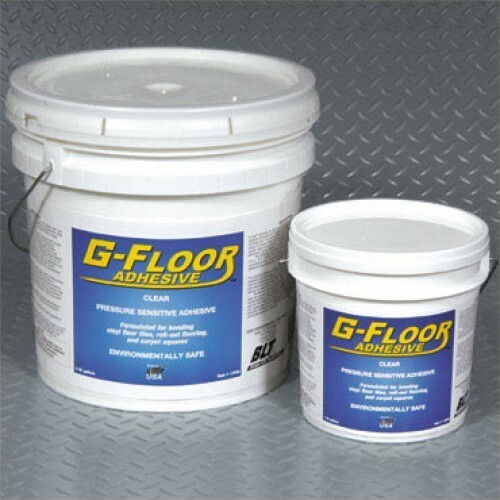 NOTE: Basic installation of G-Floor© Roll-Out Flooring does not require adhesives of any kind. However, for special applications and professional installation, many of our customers and vendors have used various types of adhesives. BLT has tested and is now recommending Clear Pressure Sensitive Adhesive (PSA) for some applications. Always read and follow label directions for best results.